HOHAM's Heroes was a collaboration between Humanities (me) and Art (Shani Leader) - though in the interest of full disclosure I will say now that nearly all the actual work took place in art. Here you can see some of the heroes - you can find each hero's profile beside their picture. Super-power: Alice uses metaphorical statements literally to point out unimportant facts and holes in her foe’s arguments. Costume: A nice sweater and hand-me-down jeans. Origin story: Alice Smarts is a university student who always looks at things differently than most people. Her use of Evidence and intelligence helps defeat the evil Theoretical Man. Origin story: An art teacher and a humanities teacher create two tech suits that correspond to their topics and work together to defeat the evil Procrastinator. Origin story: Jimmy was a normal kid living a life that he enjoyed, but wanted something more. Working with his Physics teacher, they put together an elixir similar to a recent space discovery. The elixir transformed Jimmy into Cool Kid. Using intellectual curiosity, he stops crimes in and outside of school. Arch-nemesis: Buck, the school bully. 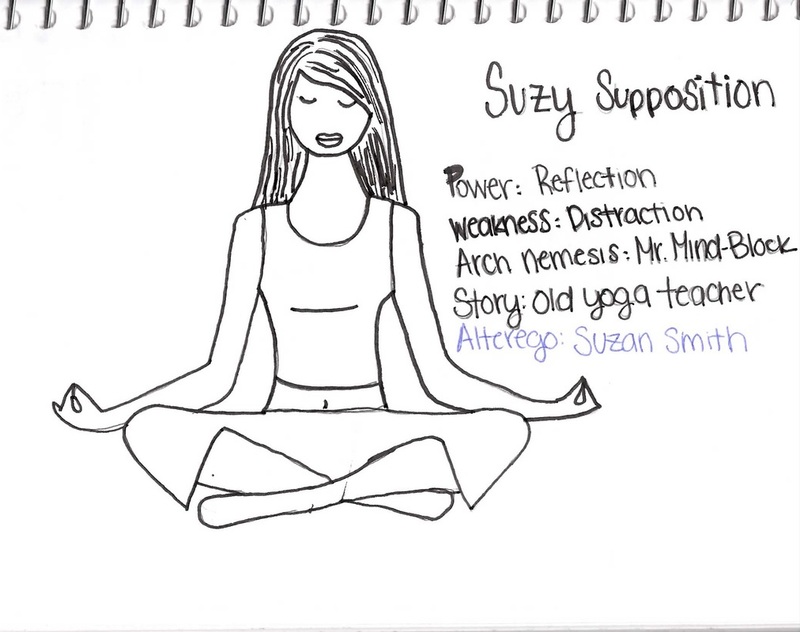 Origin story: Suzy is an old yoga teacher who, throughout her years of yoga classes and research, was able to harness the power of supposition.